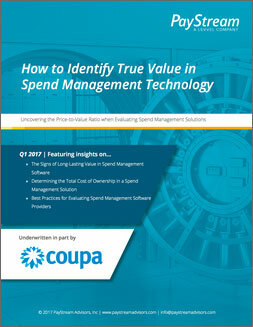 Properly evaluating today’s cloud-based, dynamic spend management technology requires preparation, education, and a strong focus on the value-based criteria that an organization is trying to achieve. Only then can organizations ensure that their measurable outcomes and transformation goals will be achieved, and that the spend management solution’s long-term costs will not exceed their budget or hurt their anticipated ROI. This report by PayStream Advisors, provides guidelines on how to properly evaluate and interact with potential spend management software providers throughout the RFP process. It also includes a calculator to help organizations determine the 5 Year Total Cost of Ownership for any spend management tool.